Leaking Stoppage Agent - MUHU (China) Co., Ltd. The product is a new high-tech products developed by our company, its feature is quick setting and hardening, high minute strength and can produce micro expansion and can be used extensively in the urgent leaking stoppage and repairs of funnels, mines, culverts, water pools, basements, roof coverings and military projects, fit for use in large volume dry basis leaking stoppage, high speed jet and anchoring as well as special projects in winter construction and water proof and leaking stoppage agent, etc. 1. Before using, cut the leaking point or seam into the shape of bell mouthing or wedge, clear away the scraps and prepare suitable tools and measuring instruments. 2. 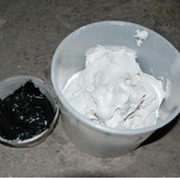 Put 1kg of the leaking stoppage into the pot, adding 0.30 -0.36kg of water, quickly mixing it into fluids. In winter construction warm water should be used, and in summer construction cold water is used. Excessive or lack of water all affects the construction quality. Too much water make the fluids too thin and reduces its strength while the lack of water makes the fluids dry and hard, sample can be used if the conditions permit. 3. Quickly press the mixed thick fluid against the direction of leaking, until the thick fluid is hardened. Generally within 10 minutes water leaking can be stopped, then apply mortar mixed with expansive agent or ordinary cement mortar to the surface and curing for 3 days. 4. For the serious water-leaking seam, method of drainage is adopted. First stop the upper seam and then the lower seam, and at last stop the drainage hole. 5. For large area leaking, find out the leaking point, first stop leaking with the leaking stoppage king then apply cement mortar with expansive agent. 6. Generally speaking, it is not suitable to use the powder directly to stop leaking. 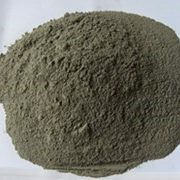 Under urgent circumstances (such as water pool or cabin leaking),powder can be applied directly to the leaking point or water pit and press it with hands or feet until it is hardened. 7. The leaking stoppage can be very hot after water is put into it, when used in large volume, care should be taken to cool it and prevent splitting and cracking. 8. 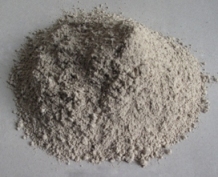 If it is necessary to prolong construction period, retarding agent can be mixed. The cement is packed in two ways: paper cartoons and packages. When packed in cartoons, the net weight of each is 20kg (containing 10 packages);damp pro of package is adopted in packaging with a net weight of 25kg each, and not less than 98% of the marked weight other forms of packaging to be decided by the supply and requisitioning parties. In transport and storage special attention should be paid to guard against dampness and not to be mixed with other miscellaneous articles. The period of storage cannot be more than 3 months, if the time limit is exceeded, or is dampened and caked, it can be used only after being rechecked to see if it is qualified.